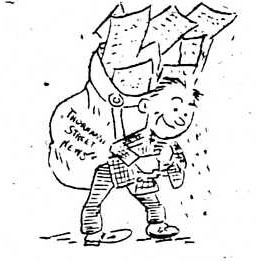 In the 1930s and 1970s, the “young reporters” of Chevy Chase – the children who reported for the Thornapple Street News, the Shepherd Street News and the Leland Street Sunday News, were inspired by the “grown-up” newspapers that their parents read: The Evening Star, The Washington Post, and others. Larry Williams, writing for the Thornapple Street News, and Claudia Kolker, a reporter and editor of the Leland Street News, were inspired by the newspapers that held their parents' attention every morning. In their own newspapers, they tried to emulate every step of news production: reporting, editing, printing and delivering their papers in a “professional” way. Some of the original “young reporters,” such as Claudia Kolker, went on to become professional journalists. Today, print journalism is no longer the prime source of information in Chevy Chase homes – our news comes to us in digital forms on television, radio, laptops, tablets, and mobile phones. Instead of mimeographed sheets, neighborhood news is delivered via email listservs and blogs. Children are now “digital natives,” adept on a range of digital platforms. But will these new forms of local news continue to reflect children’s perspectives? Will Chevy Chase children still want to report and write about new kids on the block, new pets, and the summer vacations of their neighbors and friends? In the future, will Chevy Chase Historical Society be collecting digital blogs written by children? Children of all ages can help write and produce a family newsletter (and students can write a classroom newsletter) at the end of each year. There are downloadable templates online that can serve as a guideline. Consider putting a neighborhood newsletter or blog together. Even if it is published just once a year, both the reporters and the readers will learn something new about their neighbor -- and perhaps even make some new friends! If you enjoyed this exhibit, please explore the Chevy Chase Historical Society's website to learn more about our local history. You can visit the Archive and Research Center -- just drop in on Tuesdays, between 10am and 2pm, or call and make an appointment for another time. You can read our entire collection of these newspapers, and also learn about other interesting documents and photographs. The Thornapple Street News, April 2, 1932. CCHS 1989.27.01. Click Next for "About the Exhibit"